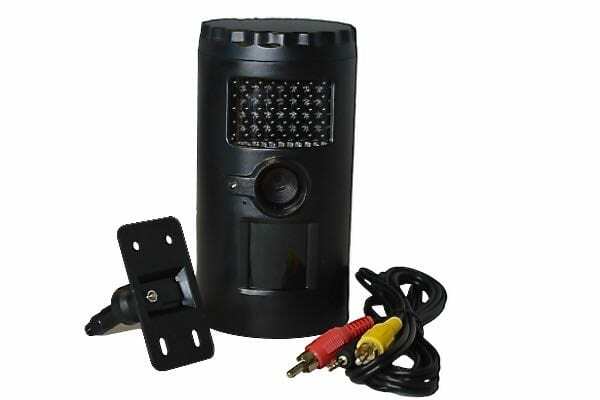 The Spy Pod is a self-contained compact and discreet battery powered outdoor spy camera system with built in DVR. Simple to deploy in a variety of situations where discreet day and night outdoor surveillance is required. This is a superb all-in-one discreet spy camera and DVR all built into a compact and discreet waterproof housing that is powered by battery ensuring that it can be deployed almost anywhere outdoors to protect both domestic and commercial property. 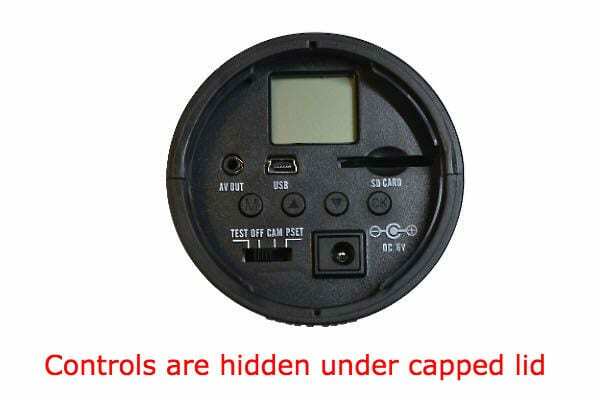 Most self-contained outdoor cameras are built into camouflaged enclosures for deployment as hunting/game/trail cameras and although this type of camera can be used in a green/leafy environment to keep watch on property and buildings, there was a distinct lack of simple to deploy self powered systems that could be added to the exterior of a building to gather vital video evidence. With the introduction of the Spy Pod Outdoor Security Camera, this gap has now been filled. The colour and shape of the Spy Pod allows it to be placed discreetly on the perimeter of a house, out-building such as shed, garage or even barns and other more remote storage units. 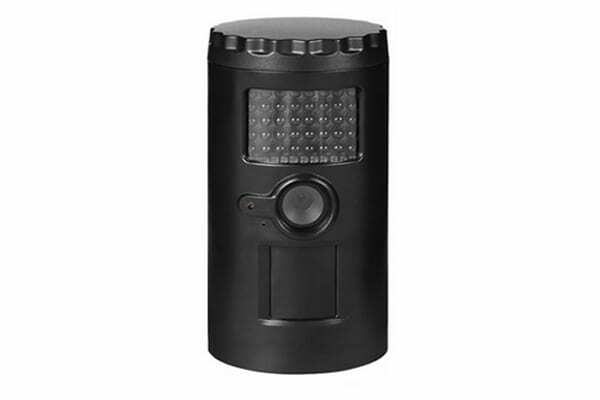 The spy camera can record in 720p (real time) high definition both during the day and also at night when the ‘No Glow’ LED infrared illuminators (940NM) will automatically come on. The ‘black’ infrared LED’s provide illumination for an area up to 15m in front of the unit. These LED’s illuminators emit an infrared glow at a frequency below the spectrum that can be seen by the human eye. This results in no visible glow from the unit, making it completely discreet although the device is still capable of capturing video/still images when in complete darkness. The inbuilt PIR can detect change of temperature/movement in vicinity which will trigger motion activated video recording or photo snapshots. Still images are of high quality (12 megapixels) and both video and stills have time and date stamping enabling use for evidential purposes. With time lapse and motion detection capability as standard and SD card DVR capable of accepting up to 32GB cards, the Spy Pod is the perfect ‘stand alone’ security camera for a variety of outdoor situations. Recorded files are compatible with all Windows operating systems – No special software required. Is this product available in any other colour? No, unfortunately at the moment these devices are only manufactured in a black casing designed for discreet deployment in a variety of circumstances. Is the Spy Pod Outdoor Security Camera completely waterproof? The device when sealed correctly with be completely weatherproof to IP66 rating, however, we could not guarantee that it would remain watertight if completely immersed in water. Is the unit provided with anything to attach it to a tree or similar? A strap is provided to attach the unit to a tree or pole and there is a special mount that screws into the base or back of the unit for attachment to a wall or ceiling/overhang. Will the Spy Pod record sounds as well as video? This device is does have facility to record audio when it is capturing video. How do I playback the recorded video, and view captured still images? The video/stills files are recorded onto an inserted SD card (full size card) and can be played back and viewed on a computer. Do I have to connect this device to a computer to program the settings? No, there is a concealed LCD screen that is accessible via a twist off hatch on the base that allows ‘on-site’ programmability. Although this unit is IP66 rated making it weatherproof, this does not mean that the units is watertight if submerged. 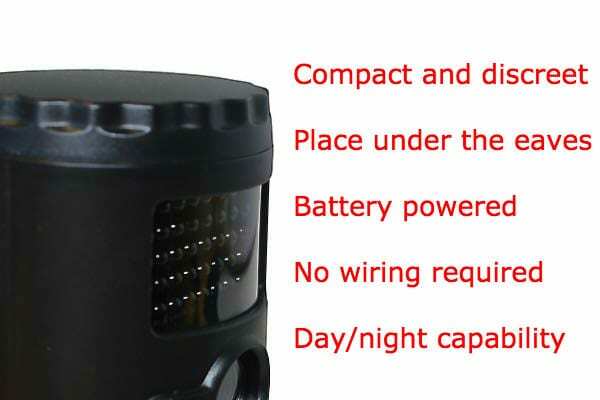 The device is powered by a minimum of 4 x C size batteries that are NOT supplied with the unit. These are not stocked by Spy Equipment UK, but are available form high street stores and online retailers. The device is not supplied with an SD card as standard, although these are available as an optional extra on the product. You will require a computer on which to playback recordings from the SD card. This can either be Windows or a Mac. You will need a media player on the computer for playback of video. It maybe worthwhile downloading a free media player. We use VLC Media Player at Spy Equipment UK.